Need more information about booking Home 1774074 ? 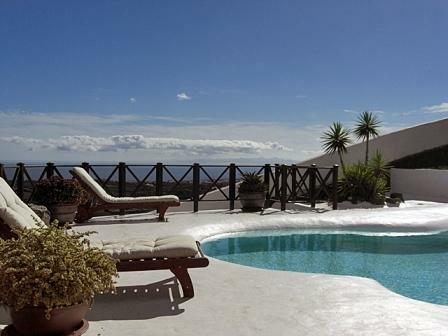 This beautiful rural holiday villa in Lanzarote is an ideal choice for those looking for something a little special. The villa is in Conil, a village situated at the edge of Tias, a traditional Lanzarote village next to Lanzarote's famous wine growing region La Geria. The surrounding rural area is protected as Lanzarote was declared a Biosphere Reserve in October 1993 by UNESCO. Villa Papaz with its Luna landscape is excellent for walking-, golf- and cycling holidays in Lanzarote. Book our villa in Lanzarote and enjoy a relaxing holiday in this perfect location where you can discover the beauty of the Lanzarote countryside and the unique architectural treasures hidden in its towns and villages where you will see the influence of the late Lanzarote conejero (local) Cesar Manrique. Cesar Manrique has been an inspiration for the builder as you can se on architecture and details. The electrical- and solar heated swimming pool is located on the hillside overlooking the Islands of Lobos, Fuerteventura and the Atlantic ocean. This peaceful rural situation is surrounded by open fields and looming volcanoes, just a few minutes drive from the Yachting Marina of Puerto Calero and Lanzarote's main tourist resort of Puerto del Carmen, both providing some of the best entertainment and cuisine on the island. Ask for a "last minute offer" if you book later than three weeks before arrival. Villa Papaz is conveniently situated only 10 minutes drive from the airport and ten minutes drive from Lanzarote's main tourist resort of Puerto del Carmen. It is also near the exclusive Yachting Marina of Puerto Calero. The villa is south facing and boasts spectacular views of the surrounding countryside, Atlantic ocean and neighboring island of Fuerteventura. The Cesar Manrique inspired electric heated Swimming Pool is surrounded by gardens. There are spectacular views of the neighbouring Island of Fuerteventura. Many of the walls in the house are made double skinned. This was for two reasons; firstly to insulate the house, as this helps to keep out the heat in the summer and the cold in the winter, and to also give the villa a Rustic feel as all of the traditional houses on the Island were built with thick stone walls. The master suite is on the first floor with french doors opening onto a Juliet balcony and roof terrace. There are three double bedrooms on the ground floor with a large bathroom that has a natural stone garden feature in it. There are Designer Taps and Sinks in both bathrooms and all the tiles throughout the house are of the highest quality. The internet capacity is poor in rural areas like Conil. There is wifi in the villa, but only enough data to read email, news and simple browsing (5Gb per month (less than two hours HD-streaming)). Once you watch youtube/Netflix/HBO or other streaming services, you will run out of data quickly. If you are really unlucky, former guests might have used all data (this has only happened once). Villa Papaz is situated central on the island and everything is within easy reach. If you do not have a car, we recommend using a taxi if you would like to visit restaurants or other places outside Conil. There is also a bus stop in Conil. It is very important for us that your stay in our villa is perfect. Please do not hesitate to contact us if you have any questions. We are not able to meet you at arrival. You will find the keys in the keysafe at the entrance. You'll need to send Anette (the owner) an enquiry to book - the owner will let you know how to pay. If they accept online booking they'll send you a quote and info on how to pay. If you pay through our website you’ll be covered by Payment Protection. Or you can send Anette (the owner) an enquiry through the contact form to request a quote. Anette (the owner) will email you the total cost for your dates and how to pay. Send Anette (the owner) an enquiry through the contact form requesting a quote for your holiday dates. Anette (the owner) will email you the total cost for your dates and how to pay. Anette (the owner) of this property is responsible for taking and refunding your damage deposit. The damage deposit terms should be agreed before booking and outlined in the booking contract, if Anette (the owner) supplies one. Please refer to these details or contact Anette (the owner) directly if you have any questions. You'll need to contact Anette (the owner) to cancel. They should have provided their contact details when you made your booking - otherwise, email them through the contact form. You'll need to contact Anette (the owner) to edit your booking. They should have provided their contact details when you made your booking - otherwise, email them through the contact form.